If one can remember the 'Indian Summer' of 1976, the thoughts are of a gloriously sunny, hot three months of June, July and August, a marked contrast perhaps with the more traditional English summer. Though the memories may favour the more pleasant side of things, the three months without rain brought drought conditions across parts of the country and water rationing in many areas. But none of that was center stage on August 22nd 1976. This busy Sunday was spent touring with the Midland Railfans group, including the Birmingham area depots. 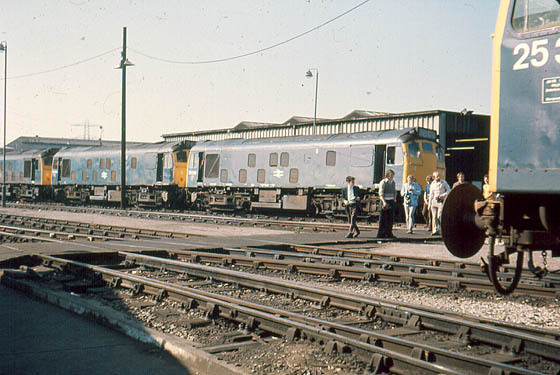 Saltley was well populated this day with a variety of British Rail's diesel fleet. Standing by the fuelling shed are two Scottish Region Type 2s, 25028 & 25034. They had more than likely arrived on the Leith - Salisbury pipes, presumably replaced somewhere between Banbury & Didcot, then returning light engines to Saltley prior to picking up their next set of northbound duties. The seventeen year ten month career of D5178/25028 was spent allocated to depots on the Eastern & Scottish regions.The allocation history for 25028 is similar to that of 25026 & 25027, but after transfer to the Scottish Region in July 1971 25028 remained at Scottish depots until withdrawn. 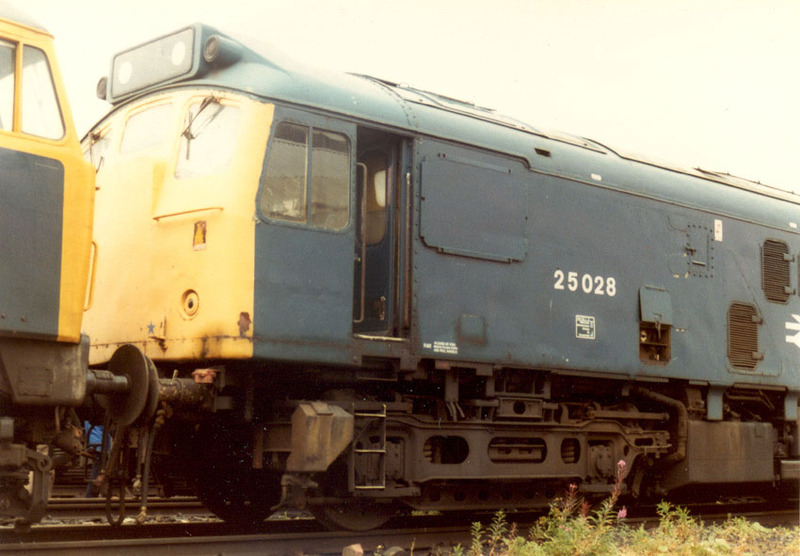 25028 was the lowest numbered of the Class 25s to recieve dual braking equipment. Time between last Classified repair and withdrawal: 36 months. Time between withdrawal & scrapping: 78 months. June 1963 to Gateshead (52A). October 1965 to York (50A). December 1966 to Thornaby (51L). September 1967 to Holbeck (55A). July 1971 to Eastfield (65A). October 28th 1980 to unserviceable store. After withdrawal 25028 was stored at Millerhill until September 1981 when it moved to Polmadie with 25046 & 25082. 25028 remained at Polmadie until February 1983 when it moved to Glasgow Works, remaining here until January 29th 1987 when it was taken to Thornton Junction for scrapping by Vic Berry. 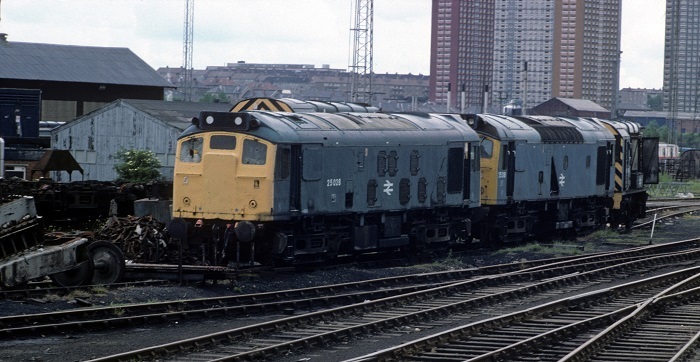 Photograph courtesy Roger Geach 25028 & 25318 at Glasgow Works on June 29th 1985. 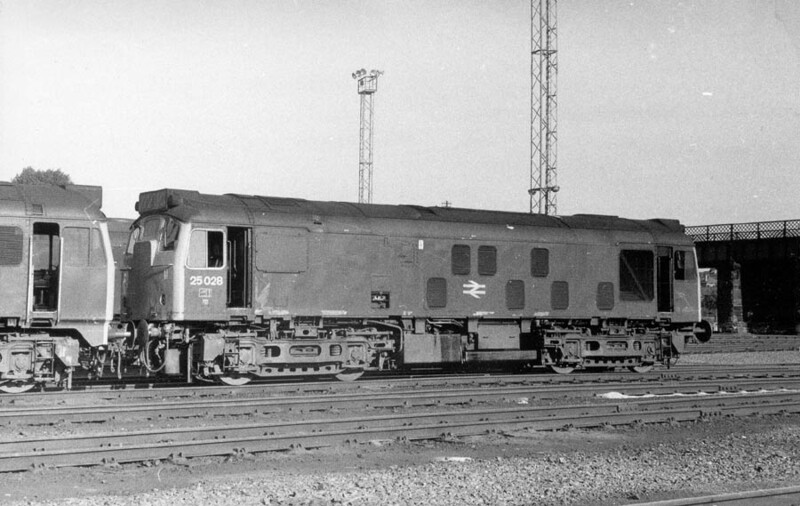 Asbestos issues were discovered with some of the locomotives being scrapped at Thornton Junction, at which time the scrapping stopped and the remaining locomotives were moved to Leicester for disposal. On June 3rd 1987 25028, 25318 & 26013 moved to Mossend Yard, June 4th 1987 to Carlisle, June 5th 1987 to Basford Hall, June 8th 1987 to Leicester Humberstone Road and into Vic Berry's yard on June 9th 1987. By the middle of June 1987 25028 had been scrapped, almost seven years after withdrawal. Noted Derby Works May 1966. Noted Glasgow Works October 1977 - December 1977 (dual brake equipment fitted). Noted Glasgow Works March 1978. The frames for D5178 were laid down in October. Darlington outshopped boiler equipped D5178 on February 8th to Leeds Holbeck (55A). For the locomotives based at Holbeck passenger work was a frequent occurrence, both local and longer workings as D5178 was so provided on February 14th for a run to Morecambe only six days fresh out of Darlington. By this time the vast majority of the Leeds local services were in the hands of diesel multiple units. On June 3rd 1963 the 09.33 Morecambe - Leeds was hauled by 5178. After transfer to Gateshead during June D5178 was noted on one of the freight turns from Scarborough on May 20th. During the first week of September Newcastle had only one regular steam passenger working, the 16.30 Newcastle - Berwick which ceased on September 5th. Gateshead A3 60092 hauled the last steam working on 4th, with the final run the next day being handled by D5178! In the winter timetable this became a diesel multiple unit working. D5178 moved south from Gateshead during November, joining D5176 at York (50A). A visit was made to Derby Works during May. D5178 transferred to Thornaby (51L) in December. In September D5178 moved back to Leeds Holbeck (55A). In the Liverpool area steam still served several passenger trains, though many of these were slowly transitioning to diesel haulage, one such was the 23.38(SO) Liverpool Lime St - York, noted on New Year's Eve 1967 behind D5178. 5178 was at Derby Works in June for a general repair. June 5th's 1S28 07.00 Newcastle - Edinburgh was powered by 5178 which had been taken off the early morning Edinburgh - Bradford parcels working. In July 5178 headed north for allocation at Eastfield (65A). On August 7th 1971 5178 (?) worked a morning Glasgow Queen Street - Oban, returning with the 12.25 Oban - Glasgow Queen Street. 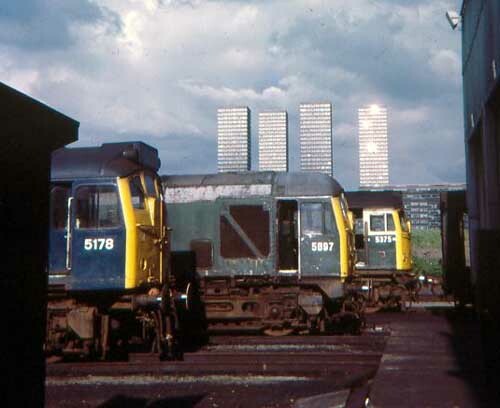 Photograph courtesy Steve Marshall 5178, 5097 and 5375 line up at Eastfield on June 4th 1972. The Blackpool Illuminations over the weekend of September 23rd/24th provided a wide variety of specials in to the area. Perhaps those with the most interesting motive power came from Scotland, noted were 5096 & 5001 and 5178 & 5385 on two of the ten specials from the ScR. Glasgow Works received 5178 for attention during October. On May 12th Glasgow Works held its first Open Day, remarkably there were sixty four diesels on display that day, although twenty seven of those were condemned Claytons. 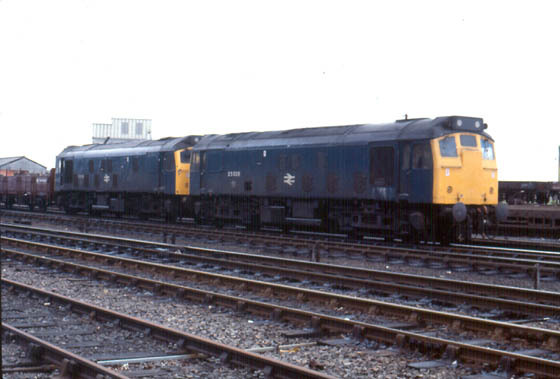 Two class 25's were present, 5178 and 5157, the latter having a replacement cab fitted from withdrawn 5149. Class 24's noted were 5006/19, 5121/27 under repair and elsewhere withdrawn 5067, 5114/49. Parts of 5068 were still present. On September 6th 1973 the 17.52 Dundee - Glasgow Queen Street was worked by 5178. 5178 was renumbered 25028 during April. In May 25028 moved to Haymarket. The 1E83 17.10 Edinburgh - Berwick on Tweed was noted behind 25028 on an unrecorded date (18th) during February. A long distance working, the Leith - Salisbury pipes featured the Scottish Type 2's working as far as Didcot, examples noted were 25028 & 25034 on August 22nd (see photograph at head of page). On August 10th 1976 the 21.40 Edinburgh - Carstairs was worked by 25028, as was the 21.40 Edinburgh - Carstairs on August 16th 1976. The Rugby International at Murrayfield on March 19th between Wales and Scotland brought a number of specials into the area, both from Wales and locally. Four extras ran from Glasgow, the first being hauled by 25028 (1Z10), the others ran with 27004, 40047 & 40071. On March 21st 1977 the 11.52 Dundee - Glasgow Queen Street was worked by 25028, as was the 08.15 Inverness - Edinburgh forward from Perth with 26031 on April 12th 1977. Photograph courtesy A Forster A fine side view of 25028 at Eastfield Depot, date unknown but certainly before it entered Glasgow Works during October 1977. Glasgow Works received 25028 for repair including the fitting of dual brake equipment between October & December. 25028 was noted at Glasgow Works during early in March. Regretably no sunshine here as 25028 & 25082 marshall their train at Inverness on June 22nd 1978. 25082 had been transferred to Inverness the month before and would remain at Inverness until January 1980, when it moved south to Haymarket. 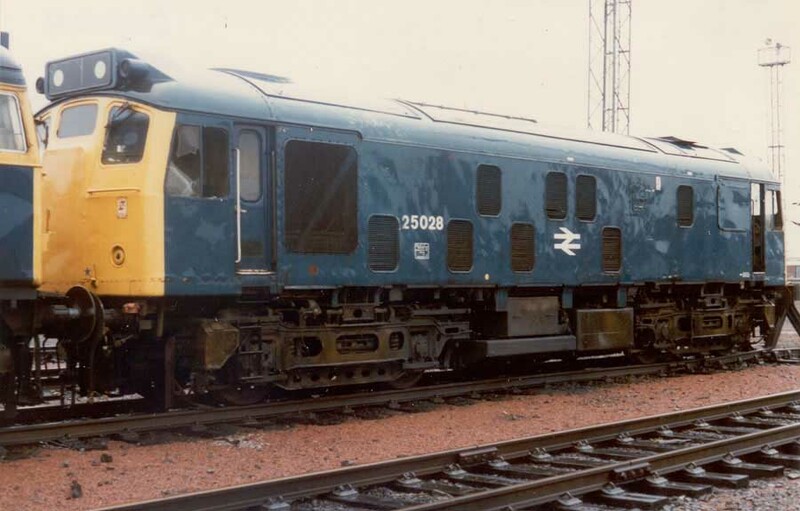 25028 had been transferred to Eastfield in January 1971 and would remain allocated to the Scottish Region until withdrawn in December 1980, though it would be June 1987 before 25028 actually left the Scottish Region! July 3rd found 25028 on the 14.44 Glasgow Queen Street - Dundee working, so far this is identified as its last passenger working, though being dual-braked and with a boiler on the Scottish Region there must surely be later workings out there somewhere! It appears the reliability of 25028 suffered during the summer of 1980. In early July it was stopped at Polmadie with a traction motor fault, by the middle of July it was stopped at Motherwell with the same fault and similarly at Polmadie in early September. By the middle of October 25028 was stopped at Haymarket with loss of power. On October 28th 25028 was placed to unserviceable store, being moved from Haymarket to Millerhill. On December 1st 25028 was withdrawn, remaining at Millerhill. Photograph courtesy A Forster Millerhill April 4th 1981, 25028 presents an interesting side view. It had been withdrawn four months earlier on December 1st 1980 and had spent this time dumped at Millerhill. Millerhill finally said farewell to dumped 25028/46/82, the trio moving to Mossend during September with 25028/46 going forward to Polmadie and 25082 reaching Kingmoor by early November. Photograph courtesy A Forster A wet day brings up the shine on the paintwork of 25028 at Polmadie on March 6th 1982. Photograph courtesy A Forster A close up of the No.2 end of 25028 at Polmadie on August 14th 1982. A builders plate from 25028 sold at Great Central Railwayana Auctions for �540 during June 2016. Page added July 19th 2003. Page updated March 23rd 2018.